Home Afro Birthdays	Today’s Afro Birthdays ! Olympic Sprinter/Long Jump Champion, Carl Lewis ! Gospel singer, Thomas A. Dorsey ! Rapper, Missy Elliott ! Blues singer, Willie Dixon ! Today’s Afro Birthdays ! Olympic Sprinter/Long Jump Champion, Carl Lewis ! Gospel singer, Thomas A. Dorsey ! Rapper, Missy Elliott ! Blues singer, Willie Dixon ! Today in Afro History ! Carl Lewis breaks world indoor long jump record in 1984 ! Today in Afro History ! 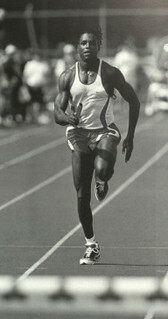 Carl Lewis wins 4 gold medals at Olympics in 1984 ! Today’s Afro Birthdays ! Tennis player, Serena Williams ! Singer/Actress, Christina Milian ! Singer, Shawn Stockman ! Today’s Afro Birthdays ! Author, Alice Walker ! NBA player, Jameer Nelson ! MLB player, Mookie Wilson ! Singer, Barbara Lewis ! Actor, Michael B. Jordan ! Actress, Camille Winbush !